The strong desire to take Srila Prabhupada's position and become an unauthorised diksa guru in ISKCON has led to deviation from even Srila Prabhupada's basic teachings. Below we present a shocking example of this, with the statements in the shaded boxes being from a class given on 29/8/18 by GBC-elected guru HH Atmanivedana Swami. All emphases added. "Everyone has to see Krsna according to the verdict of Vedic literatures presented by the self-realized spiritual master. A sincere person is able to see Krsna through the transparent via medium of Sri Gurudeva, the spiritual master." "who is a bona fide guru or who is not a bona fide guru. [...] Guru means not just giving diksa, but giving them transcendental knowledge. [...] The medium may not be completely perfect, but the knowledge is perfect. [...] So even if it comes through a contaminated source, it still remains pure. Just as Prabhupada says, ‘Gold in its natural state is very pure, and if it happens to fall into a gutter and becomes contaminated by the sewage water, still the gold will remain pure'." Atmanivedana Swami claims that because transcendental knowledge remains pure, the source of the transcendental knowledge, the transparent via medium bona fide diksa guru, can be contaminated just like gutter sewage. "Caitanya Mahaprabhu spoke in that way, and my spiritual master used to say, "The spiritual master is the transparent via medium." [...] We cannot see God with these eyes, we cannot hear Hare Krsna with these ears, we cannot do anything without the via medium of the spiritual master. Just as a defective eye cannot see without the via medium of spectacles, so one cannot approach the Supreme Lord without the transparent via medium of the spiritual master. "Transparent" means that the via medium must be free of contamination." Thus, Atmanivedana Swami's "the transparent via medium bona fide guru can be gutter sewage" theory is rejected by Srila Prabhupada as actually being nonsensical gutter sewage. 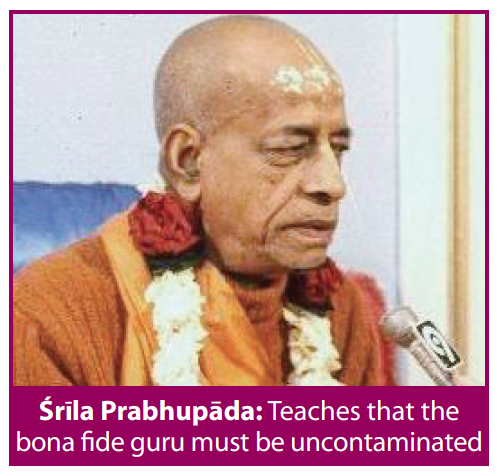 Yet, this idea that the diksa guru can be a contaminated source and still be bona fide is shared in general by other ISKCON GBC gurus, whom we have quoted many times in previous issues. "Otherwise we can get into a lot of difficulties and saying, ‘Well, he's not pure but he's acting as a guru', we start committing offense. [...] he's acting on behalf of the parampara, and he's acting on behalf of Krishna's message, because Krishna says, "yare dekha, tare kaha ‘krsna'-upadesa", ‘wherever you go, whoever you meet, speak about Krishna'." There have been many GBC gurus who were deviating for long periods of time whilst acting as supposedly bona fide parampara diksa gurus (i.e. gurus in the disciplic succession). For example, Umapati deviated sexually "with several male disciples over a number of years" before he was defrocked as a guru in 2010 (GBC Statement from GBC Meetings, 2010), and Balabhadra/Bhakti Balabh Puri also engaged in "many explicit sexual acts" and "repeatedly fell down" before he was defrocked as a guru in 2007 (GBC Statement, September 2007). While Prabhavishnu had a "number of sexual falldowns" at least over a decade before he was defrocked as a guru in 2012 (GBC Executive Committee Statements, 13/1/12 & 2/2/12). Yet, during these long periods, whilst they were deviating but still acting as ISKCON-recognised diksa gurus, they were giving classes, lectures, darsanas, etc., and continuing to "preach". And thus, during this time, they did speak about Krishna – after all, even the GBC gurus have yet to deny that Krishna is God! Hence, they were fulfilling the basic criterion of "yare dekha, tare kaha ‘krsna'-upadesa", i.e. telling those they met about Krishna. Hence, if we accept that simply this speaking about Krishna makes one a bona fide parampara diksa guru, as Atmanivedana Swami claims, then it would mean that sexual deviants are bona fide diksa gurus in the parampara whilst they are deviating. However, considering such sexual deviants to be bona fide gurus who are connecting their disciples to the parampara would be an example of sahajiya-vada, as such connection would now have been made into a very cheap thing: Cc., Madhya-lila, 24.330 states, "They are also called baulas or prakrta-sahajiyas. Their aim is to make the connection between the spiritual master and the disciple into a very cheap thing." "Yare dekha tare kaha ‘krsna'-upadesa: "You become guru. No qualification required. Simply you repeat what Krsna has said." [...] So who cannot do it? Anyone can do it, even a child. [laughs] Our Syamasundara's daughter. She was preaching, "Do you know Krsna?"" And thus it refers to one attempting to act as a basic instructing guru or preacher, rather than a diksa guru in the parampara. We are told that these GBC-elected "living" gurus are themselves the "transparent via medium" needed to connect us to Krishna. However, they do not even understand something so basic as what it means to be the "transparent via medium"! And in order to justify their unauthorised guru positions as "successors" to Srila Prabhupada, they are even willing to promote a sahajiya understanding that any sexual deviant is a bona fide diksa guru in the parampara as long as he speaks about Krishna. Hare Rama, Hare Rama, Rama, Rama, Hare, Hare. And be Happy!